Oluwani shola (God creates wealth) Estate located on the Lekki/Ajah Expressway the home of billionaire businessman, industrialist and Chairman of Eleganza Group, Chief Rasak Akanni Okoya is famed for its elegant architecture, stylish lawns and classy fittings. 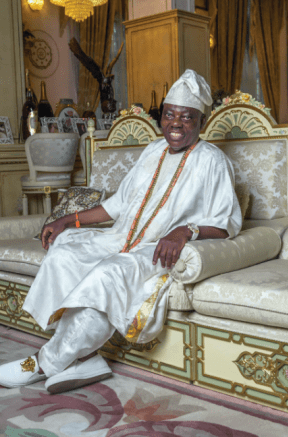 It was within this heavenly and classy ambience that friends and family gathered to celebrate the 77th birthday of this remarkable man who holds the Chieftaincy title of Aare of Lagos. Though many were involved in the preparations, there was no doubt that at the thick of things was his younger wife, Chief (Mrs.) Folashade Okoya who was working the phones even till the very last minute to ensure that the day was a huge success. Indeed, the day turned out very grand and colourful with an assortment of celebrated Nigerians turning out to honour the Chairman of Eleganza Group of Companies. From the décor, which was stately, to the full course meal, the exotic drinks to the refreshing music provided by Demola Olota and his band, guests were certainly in the mythic seventh heaven! It must be said though that as a faithful Muslim, the ceremony began with a session of prayers by some Islamic clerics who also spiced the session with Quranic recitation. Family and friends, including his first wife, Alhaja Kuburat Okoya took turns to donate a few naira notes to the cleric for special birthday prayers for the celebrant. According to Chief Okoya, there was no way he was going to host a birthday party without prayers because, he was fully aware that it is Almighty Allah that has brought him this far and showered him with blessings and excellent health. With the prayers over, the session dovetailed into a full-fledged party complete with five-star pampering from the Okoya family. Born on 12 January 1940, Chief Razak Okoya is a real Lagos boy. He was bread and buttered in the heart of Lagos popularly called Isale Eko. As a young boy, he worked in his father’s tailoring business which also included the sale of tailoring accessories. The experience he got gave him the confidence to start mini tailoring activities on his own. He saved every penny he made until he had 20 pounds. His mother gave him an extra 50 pounds, with the blessings of his father. That was when he went solo! With with then Seed Capital of 70 pounds what has become the behemoth Eleganza group was born, His first business was importing and trading in goods from Japan. Chief Razak Okoya’s business expanded swiftly, he travelled far and wide and learnt how things were manufactured having the strong feeling that Nigerians could match that quality if not better. His first wife, Alhaja Kuburat Okoya, was obsessed with costly jewellery and he was always baffled at how much she said they cost. He strongly felt the prices were outrageous since the metals which could be designed at a cheaper price were readily available in Nigeria. The serial entrepreneur saw an opportunity in the making of costume jewellery. He soon went abroad, bought the machine and set up Eleganza Jewelry. The success was phenomenal. They could not keep up with demand because, the products were beautiful, durable and cheap. He also started manufacturing buttons. The story is told of how he began to manufacture shoes in Nigeria. He was a large importer of shoes and on one of these occasions, the shoes were not delivered despite payment. He traveled to Italy to see the manufacturer only to discover that they had used his money to settle bills. He was so angry that he decided to buy all the machines he needed, brought in some experts to train some local staff and began making his own brand of shoes! Today, he is the Chairman of Eleganza Industries and also owns the expansive Eleganza Industrial City. Eleganza produces a wide range of household goods and utensils including cutlery, collieries, food warmers, ice chest, electric fan, cosmetics and ballpoint pen. Eleganza products known for its time-tested quality are household names in Nigeria and neighbouring African countries. His factory locations in Lagos include,Oregun-Ikeja, Isolo, Alaba and Iganmu. The Group now directly employs over five thousand Nigerians and non-Nigerians including those working in his RAO Property Investment Company. Okoya’s Eleganza Group is certainly one of the biggest home-grown conglomerates in Nigeria today.